Have to agree with other posts here. The West Bottoms is just ideal for a makeover. 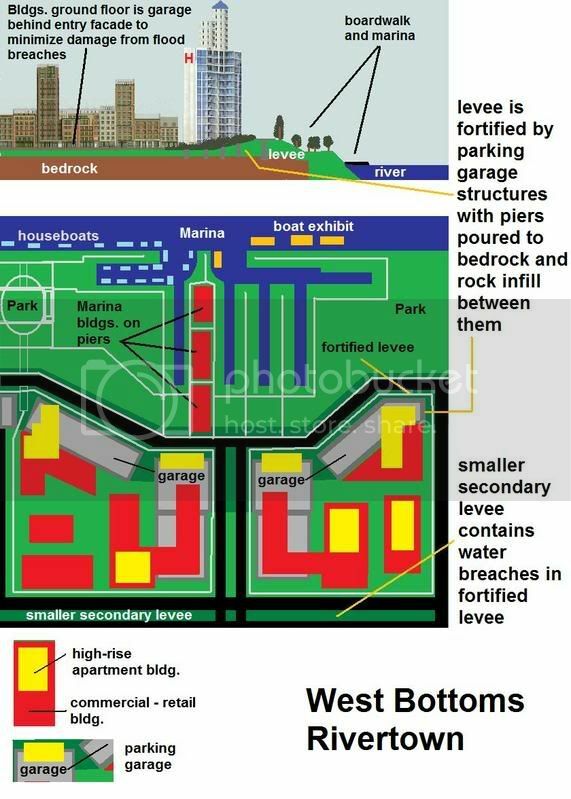 It needs to be better tied into the CBD, and I would love create water access and tackle the levee system by breaking it at points and addressing the flooding issue using other design methods. 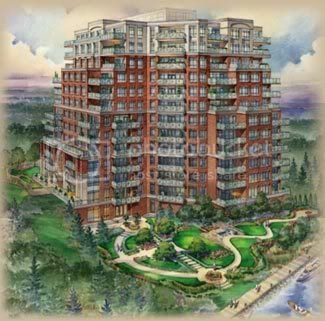 Add in some urban style row homes and condos. Allow development to keep some of the light industrial uses while repairing the infrastructure, making it very bike and pedestrain friendly. It would be easy to link the area to KCK and the Berkley Riverfront by the trails already in place. The Funicular is functional and fun. My god-like redevelopment would extend up the Quality Hill face and include redev. of the mid-rise apartments there and creating better linkage to the Bottoms. The west loop would be covered or possibly removed completely with all traffic being diverted around the eastside via a newly decked I-670. I spend a lot of time in Portland, and actually was just there last week. 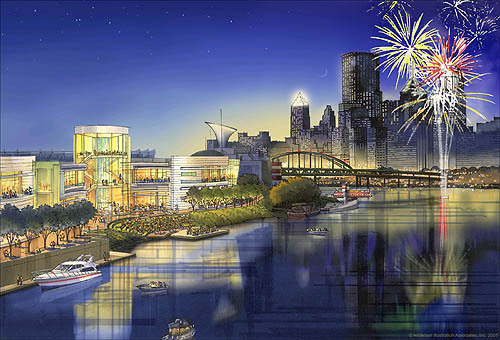 They have done amazing things along the riverfront. Good examples Tigerfan. I'm awarding you a atomic-powered expresso maker for your effort and good use of examples. Eleanor Roosevelt Memorial Boulevard approaches the Melissa Etheridge Dike. Pedestrian area in the West Bottoms marina district. Ma Barker Memorial apartment tower in the highly-desired Marina District. Last edited by FangKC on Wed Aug 22, 2007 2:53 pm, edited 1 time in total. 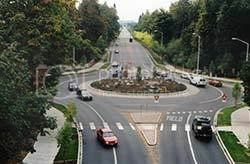 Landscaped roundabout circles in the West Bottoms make it a visually-desirable environment and generate much real estate development. 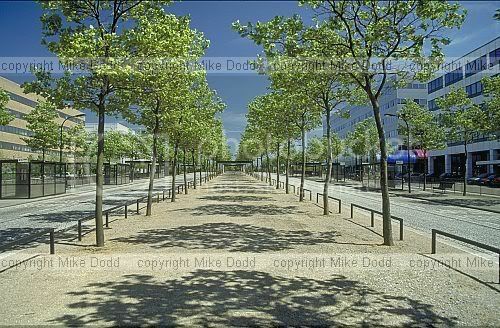 Pedestrian islands lined with trees make the West Bottoms a treat. West Bottoms (and tops) residents exercise frequently, so there is no morbid obesity among those living in the district. Just morbid curiosity when they visit the heralded Museum of Human Death and Burial in The Morgue haunted house. The Moms Mabley Tower in the Marina District is among the most fashionable residences in the Midwest. Views of Wyandotte County's Armourdale and Fairfax industrial districts demand a premium among railyard and heavy industry groupies. 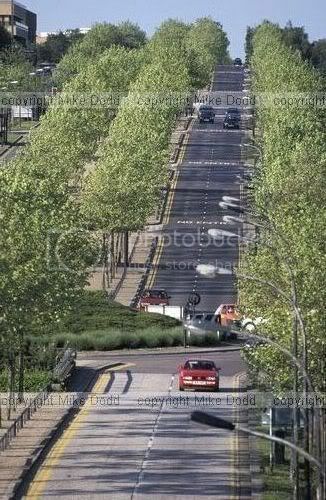 FangKC wrote: Eleanor Roosevelt Memorial Boulevard approaches the Melissa Etheridge Dike. Vision: It's the year 2020 (that's really only about 12 years from now), and Kansas City completed its fast street car spine promoted by Kansas City's Advocrat, the activist who stepped up to replace Clay Chastain, but without becoming a clay pigeon, chastised and stained for promoting transit in the best public interest. Light rail proved to be a good thing and ridership exceeded expectations and money was saved by running the system across the ASB bridge ($190 million in savings), using fast streetcars ($100 million in savings) choosing Walnut as the most practical route through CBD, and embracing technology invented by President Gore that reduced maintenance and operating costs for streetcars by more than half. Kansas City was ready to move forward, and focused on the phase III light rail line that began at Penn Valley Community College running east along Linwood, ultimately serving Truman Sports Complex with a terminus at Blue Ridge near the site of the old Blue Ridge Mall. 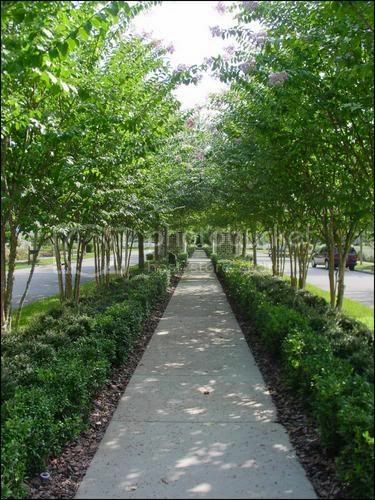 This corridor along Linwood, long neglected as a blighted neighborhood was discovered anew, recognized for splendid architecture, its boulevard characteristics, the beautiful churches along its routes and numerous homes of classic designs. During the years of neglect many homes and structures were lost, leaving vacant lots, but as Linwood began to be reborn after the development of the street car line, shops and neighborhood retail began to move in, and significant numbers of financially flush Kansas Citians decided to keep up with the Jones' in Chicago by buying the shacks and building new urbanism McMansions along the thoroughfare, blending the old with the tasteful new in accordance with the neighborhood covenants. Many new residents privately and publicly gave their praises to God for such blessings they put their money where their mouths were, initiating a dramatic change which saw the renovation and reestablishment of the beautiful traditional churches that flank Linwood for several miles, missing services only on those Sundays during Chiefs home games. Now you're talkin'. (Borat voice) "High-five." After Kansas City won the Super Powerball Lottery in Dubai while on vacation, billions rolled in to redevelop the West Bottoms and build super-levees that diverted all flood waters into KCKS and Armourdale. 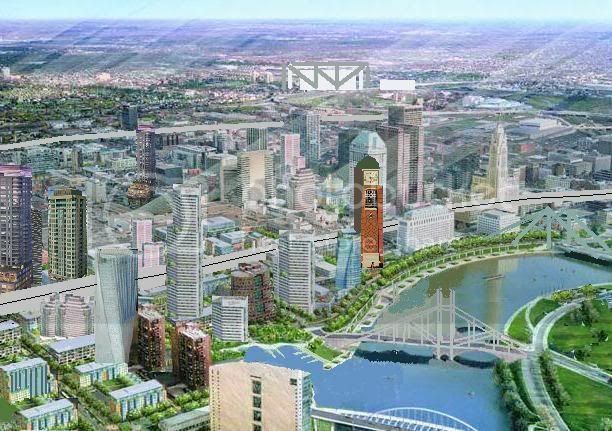 Here's what Kansas City built itself, a new project called Rivertown. The Overlook at Case Park became the city's most popular site for photography. GRID flew over the district 24/7 taking photos until he erupted into flames. He dumped a Big Gulp all over himself and clicked away. I'd redevelop Main Street and Broadway a la Milwaukee avenue with a solid wall of 3/4/5 stories between 39th and 31st, and I think if Armour was "let go," it would take care of itself. Sidewalks would be widened, and a few buildings around 6-9 stories on major intersections. Nothing would be demolished that is already built up to the curb in an urban fashion, even if its one story. I'd also run elevated light rail on the back of the eastern blocks along main...how you would connect with a transit system coming from downtown or how to plug into the trolley track i will not speculate. The back side of the eastern blocks along main would have some demolition, but in addition to the elevated light rail, there would be a greenway like strip with a walking/running/bike trail that also would connect downtown with the trolley track. Last edited by warwickland on Sun Nov 30, 2008 12:54 pm, edited 1 time in total. a midtown overhaul is key and a must-do if KC is to ever come close to its potential. Main, Broadway, Troost and Armour in particular and the blocks surrounding them really should be in much better shape than they are, and with significant reinvestment would provide such a fantastic 'city' to connect the RCP corridor. The scale and quality of the architecture (residential and commercial) matches or exceeds that of such 'midtown' and 'uptown' areas in other cities, and Armour in particular is just so beautiful and well-located that I can't believe it is in such poor shape. Elevated LRT, hmm? At this point I'm for any LRT, be it on, above or below ground. I'd love to see how something like this (or a cheapie, relatively, cut and cover subway) might work. A solid transit spine for the RCP needs to be done yesterday to improve midtown, not to mention the region as a whole. On another note...what happened to Fang? I really miss his posts. Take every old building in the West Bottoms, pick them up and fill in every surface parking lot possible from downtown to crown center in the Crossroads. For the price of a General Motors bailout, we could probably do this. how much would an elevated section of LRT cost? Theres a solid mile of it along Lambert freakin' airport, so its not like it is out of the question to do 2.5 miles of it in the middle of a city (if you wanted to go from penn valley community college to the trolley track). KC would have a nice world class starter system. I think it should be a priority that most of the system outside downtown (e.g. south of 31st at least) should exhibit real rapid transit characteristics somewhat like the Hiawatha line (which instead of elevation, has its own right of way along a rail line outside downtown). Last edited by warwickland on Sat Dec 06, 2008 1:21 pm, edited 1 time in total. I'm re-establishing this thread since I always find things on the Web that inspire me to copy it here in Kansas City. I'm torn where to put this development. I have two primary sites. Site 1 -- Broadway and 16th, south of the Denny's and to the west of the PAC, where those non-descript warehouses face Broadway now. The advantage of this site is that the parking garage could be underground and also some of it could be decked in the back of the parcel up against the freeway. This site would develop a street wall down Broadway into the Crossroads. The advantage would be great views of downtown skyline, the PAC, Liberty Memorial, and Crossroads. 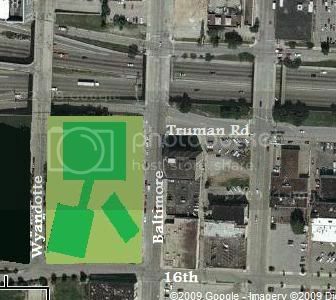 Site 2 -- The block bordered by Baltimore and Wyandotte, Truman Road and 16th Street. Garage could be mostly underground and hidden by retail space on Baltimore. 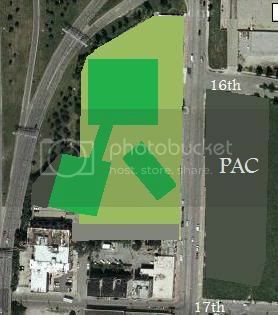 The advantage is a hotel would probably work as part of this mixed use plan, and site is close to P&L District. Views would be good and mostly unrestricted. 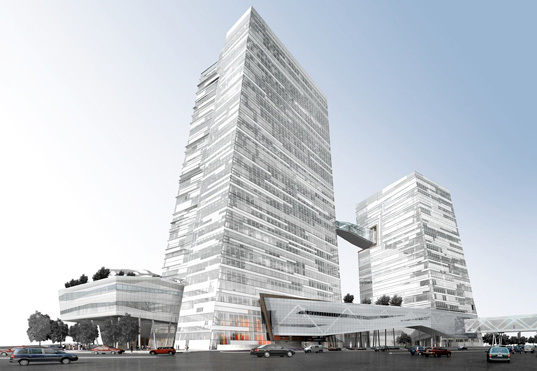 Project description: Mixed use project that hides a parking garage underneath and behind the buildings. Would have residential, hotel, and commercial tower and some retail space at street level. Hotel would probably only work at the Baltimore site though, since Broadway/16th is more pedestrian unfriendly. The actual images are of the ChinaTrust tower in Taiwan. Last edited by FangKC on Sun Dec 27, 2009 1:30 am, edited 1 time in total. 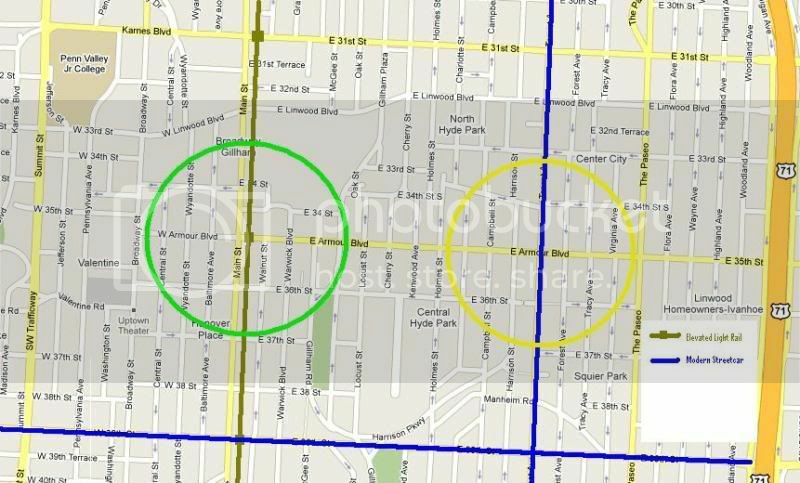 I would go for the Blue Hills neighborhood or some other similiar neighborhood north of that and east of Troost. I'd redevelop Main Street and Broadway a la Milwaukee avenue with a solid wall of 3/4/5 stories between 39th and 31st, and I think if Armour was "let go," it would take care of itself. Sidewalks would be widened, and a few buildings around 6-9 stories on major intersections. I'd also run elevated light rail on the back of the eastern blocks along main...how you would connect with a transit system coming from downtown or how to plug into the trolley track i will not speculate. The circles are on a quarter mile radius for scale purposes.